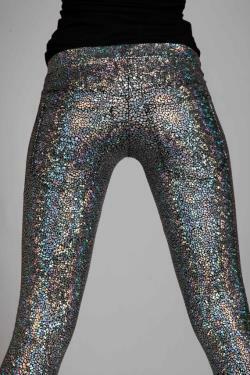 The wearer will turn heads in these low-waisted silver shattered glass patterned hologram leggings. Plain front and our v-cut pockets detail the back. The thick high quality fabric stretches four ways and provides a fabulous fit. Easy on the eyes, comfortable to wear and fit like a glove. The model is wearing a size s.
Can also be made after personal measurements, costs additional $30. Just choose custom size when checking out and type in your measurements as a message. Hip measurement (measures on the actual hip bone:). Xs: 75-80 cm / 29,5" - 31,5". S: 81-86 cm / 31,8" - 33,8". M: 87-92 cm / 34,2" - 36,2". L: 93-98 cm / 36,6" - 38,6". Xl: 99-105 cm / 39" - 41,3". Inner leg length (measures from crotch to ankle on the inside of the leg). More info in the policies section.